Samsung RS model fridge ice maker not filling with ice. QUESTION: I reset the ice maker on my Samsung RS Refrigerator as it was not working properly. I am not getting any ice cubes. The ice maker tray does not fill with water. I used a blow dryer on it to apply heat to the water line. This was to melt any ice that may have formed in the water line. This did not work as the ice cube tray still does not fill with water. Is my Samsung refrigerator problem a possible clogged or bad water valve? Does the water line pass through any sort of filter between the valve and the ice cube tray besides the main water filter in the fridge itself? Do I need to call a refrigerator repair company? Should I contact Samsung Refrigerator Support? Any help you can provide me will help. 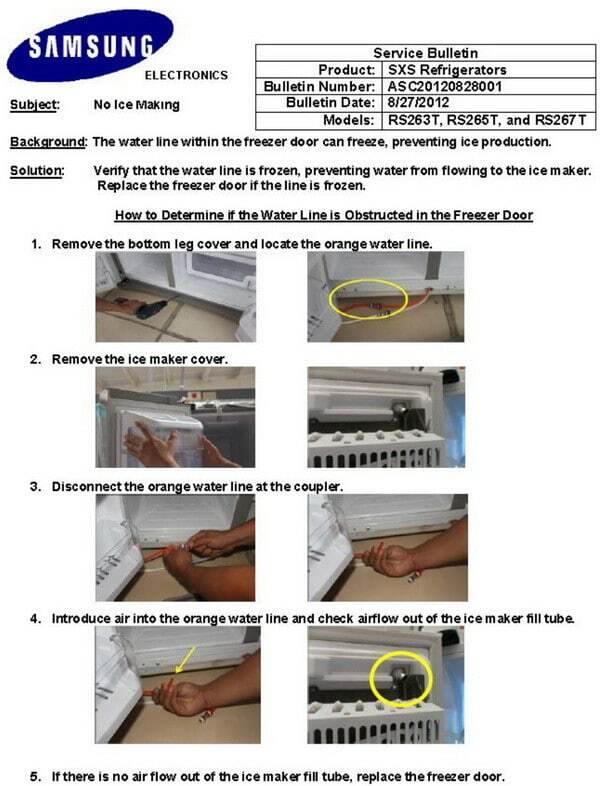 Answer: Samsung issued a bulletin for this exact NO ICE issue for Samsung RS263T, RS265T, and RS267T refrigerators. Samsung says the water line within the freezer door can freeze. Samsung states to check the orange water line at the front bottom of the refrigerator and see if the water line is frozen. It tells you to disconnect the orange water line and blow air through it. If no air comes out from the end, it tells you to replace the freezer door. However, replacing the door is expensive, some Samsung refrigerator owners simply replaced the orange water line with new and re positioned it and then wrapped it with insulation tape. Samsung’s complete repair explanation is below. please see the page here Refrigerator Freezer Not Producing Ice Cubes. 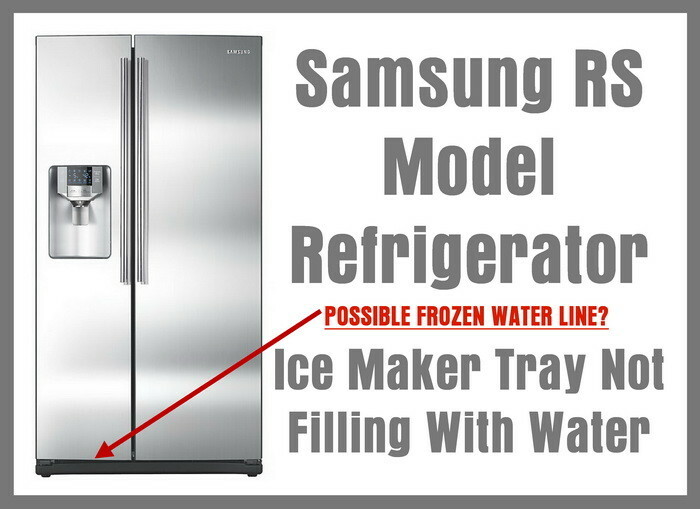 If you have this exact same problem on your Samsung RS Model Refrigerator and you HAVE NOT found an orange frozen water line as the above article suggests, please leave a comment below and we will be happy to assist you in troubleshooting the NO ICE issue. If you have found a frozen ORANGE WATER LINE, let us know if you have tried wrapping it with a thermal insulation tape and if that has fixed the issue instead of replacing the freezer door. I have a Samsung refrigerator model number RH25H5611SR/AA that the ice maker is not getting water. I took the cover off the ice maker and depressed the test button which causes the fingers to spin freely. I will replace the filter to determine if it may be clogged, however the water button works fine and the filter replacement light is not on. I am starting to think the water line in the door may be frozen. This is the second and last Samsung refrigerator I will buy. We returned the first because the contactors for the compressor were chattering. My Samsung refrigerator French door, model rf266aewp/xaa water dispenser does not shut off, it’s inside and not in the door, what can be done, I have to shut the water supply off to stop it. I have a Samsung refrigerator model # RF28HDEDBSR that won’t fill water. I have defrosted the freezer by shutting it down for 2 days. hit the reset button. Before this happened we had a build up of frost on the inside of the ice maker, that’s why i shut it down to remove the frost. My Samsung RSG257AARS/XAA ice maker quit making ice. I removed the upper cover and pressed the “Test” button. The ice maker ejector rotated and then filled with water. It works for about a day and then stops again. I repeated the procedure and it fills with water and works for a short time again. The display is also getting so dim I can hardly see the icons. It is cooling and freezing the same as when new. Do you think the ice maker water fill problem and dim display indicate a problem with the main printed circuit board? My Samsung side by side freezer ice maker doesn’t register to fill back up with water. The orange hose is not clogged. I can fill ice tray and it’ll produce the ice but just won’t fill back up. Ours starts filling with water then a two bel chime rings and the water stops filling. What can we do? I have a Samsung fridge/freezer model no RS21DCNS and the ice tray is rotating too far and is not dumping all the ice therefore it starts to fill back up with water and overflows please help ! I have a Samsung fridge model# RF4287HARS/XAA. My fridge stopped making ice. My water dispenser works find but no ice. I don’t even hear the water flowing to the ice maker anymore? We’re having this exact same problem. Did you ever get an answer on how to fix it? I have a Samsung srs702GHDss and there is no water going into the ice maker. I removed the electrical clips on the solenoid and reversed them. When i pushed the water button, water came out into the ice container. Therefore the solenoid is fine and the pipe isn’t frozen. Not sure what to do now. If the Samsung refrigerator ice maker solenoid is working, getting power, and the water line is not blocked… There may be a timer mechanism that is faulty and preventing water flow. Not sure if there is power to the solenoid as i just changed the joiners over so that i could see if the solenoid was working and it was. So not frozen or the solenoid. Still could be a power supply issue. I had this problem with my ice maker. There was no water coming out to fill the ice cube tray. I was not able to easily access the ice maker line from under the fridge so, I decided to first take a hair dryer and direct air into the hose that would usually dispense the water into the tray to melt any ice that caused the line to freeze. After about 5 min, I hit the reset button and 2 minutes later the tray filled with water. I adjusted the freezer to a warmer temp to try to avoid refreezing the line. And it hasn’t had any more problems but, if it does, I would be happy to repeat this rather than purchasing a new door!! A #2 Phillips-head screw driver is all that is required and a large pry bar. Remove the cover over the ice maker and the ice dispensing unit which is empty because it’s not making any ice. Remove the three screws holding the ice maker to the door. Support the ice maker and remove the four screws holding the dispensing unit base to the door. Pull the dispensing unit base away from the door and unplug the cable for the dispensing unit and the cable for the ice maker. Remove both units from the freezer door. Place them on the counter and allow them to thaw. After about an hour, disconnect the power to the refrigerator. Re-install the dispensing unit base, the ice maker and the dispenser unit. Restore the power to the refrigerator. Wait a couple of hours and you will hear the sound of ice falling into the dispenser and water flowing into the ice maker. I have no idea what I did but it is now working just fine. 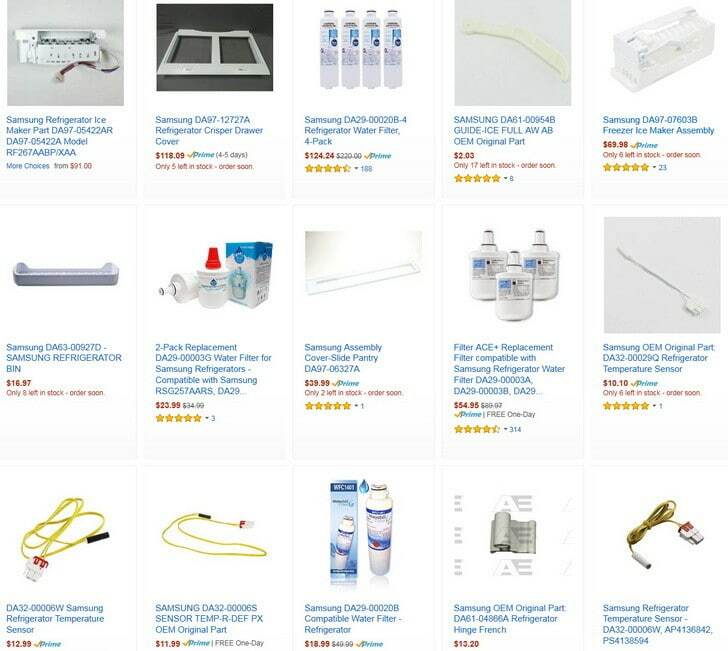 Next post: GE Dishwasher Error Codes – Electronic Models – How To Diagnose Fault Codes?